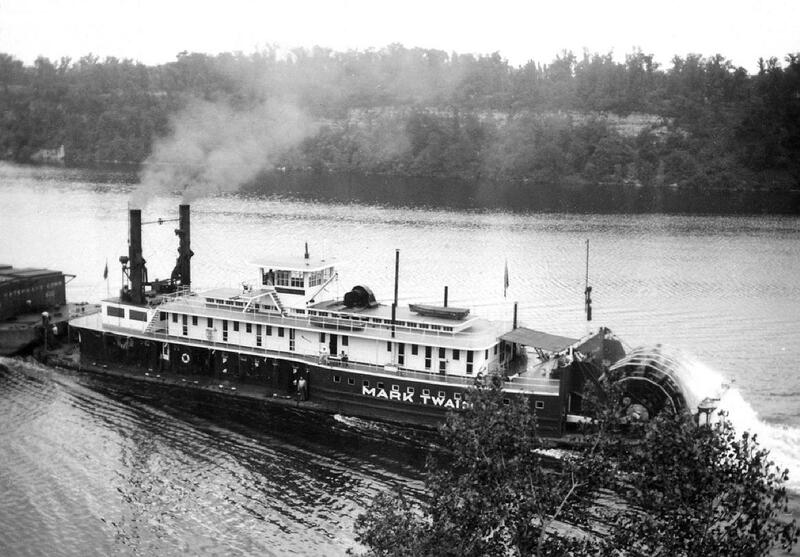 The Towboat Mark Twain in a lock and dam that is quite a ways up river from Hannibal, close to Canton. The postcard publishers obviously were selling it to Hannibal merchants who catered to tourists. Scanned off a teeny snapshot. Must've been taken from a pretty high bluff overlooking the river. 2 views the towboats MARK TWAIN and GENERAL ASHBURN at the Hermann, MO waterfront on the Missouri River. The 1st view is off a real photo postcard I just acquired of a panorama including the Gasconade County courthouse taken from the north side of the river looking south. The 2nd view is from the Murphy Library taken from the bridge and looking East. The people dressed in white may suggest that "Maifest" (a German holiday) was going on in town, I'm not sure. These weren't dated. 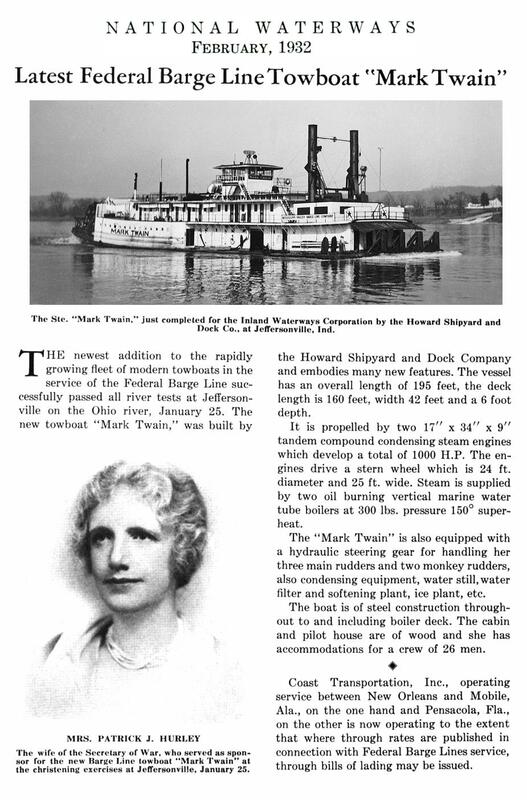 The earliest they could have been taken was 1932 when the Mark Twain was began her career and the latest 1945 when the General Ashburn's career ended. Nestled along the banks of the Missouri River, just 90 minutes from downtown Saint Louis and about 3 hours from Kansas City. The City of Hermann is a picturesque German Community offering Old-World hospitality and the quiet charms of an earlier time. With an abundance of spectacular views, more than 150 historic buildings, quaint inn and B&Bs, world class wineries, museums, shops and galleries, and fine dining, Hermann is the perfect place for romantic retreats. It is a perfect getaway not far from home! Moored at the Beardstown, Illinois levee on the Illinois River a mini-towboat with a great old old skiff to match. Wish I had such a boat to restore. I took these photos while driving north along the Illinois River en route to Peoria in the late 1990s. 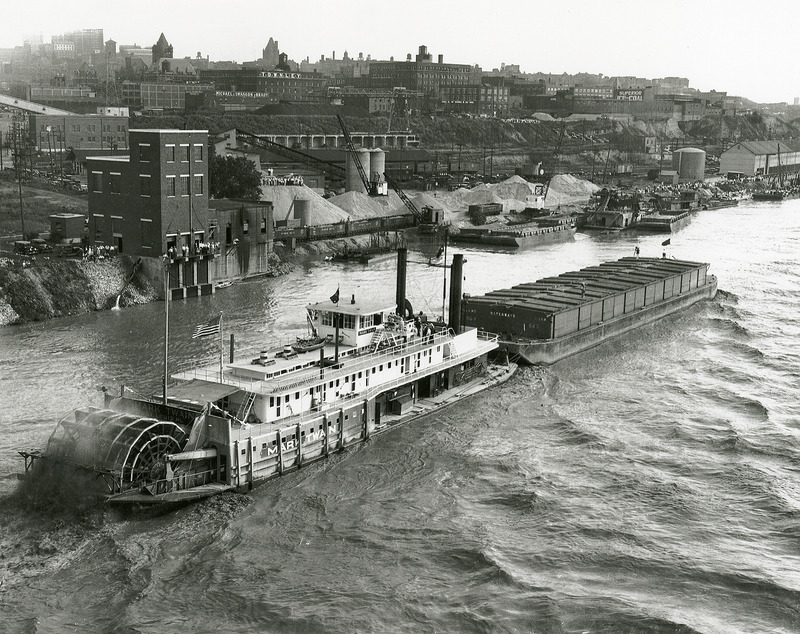 Here is a neat image with fine contrast of the impressive towboat CONTROL, enhanced from a La Crosse photo. Taken at Vicksburg, Mississippi on the Mississippi River the in 1930. 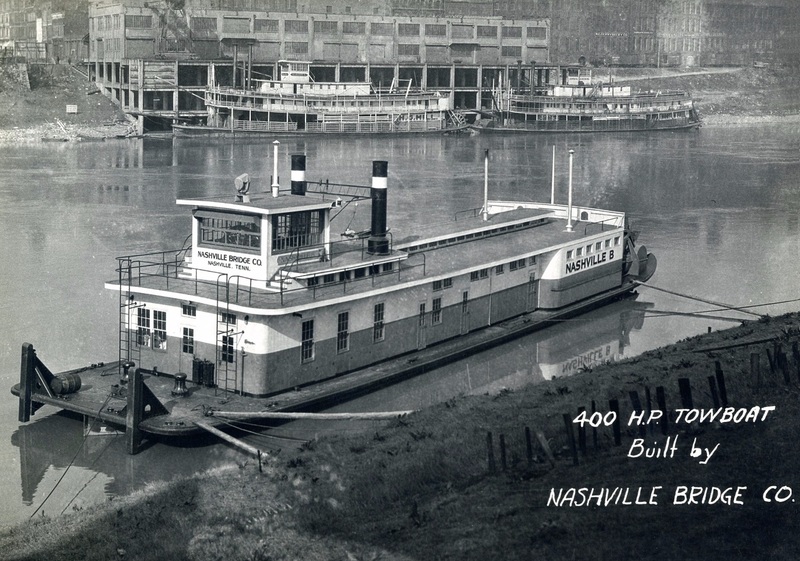 OWNERS: U.S. Engineering Department, Vicksburg District (1906); Captain George Prince (1940)In 1921 a new steel hull was built for her by Dravo at Neville Island, Pennsylvania. She was towed to Vicksburg where the old upper works, machinery, etc. were placed on it. In March 1932 she and the C.W. 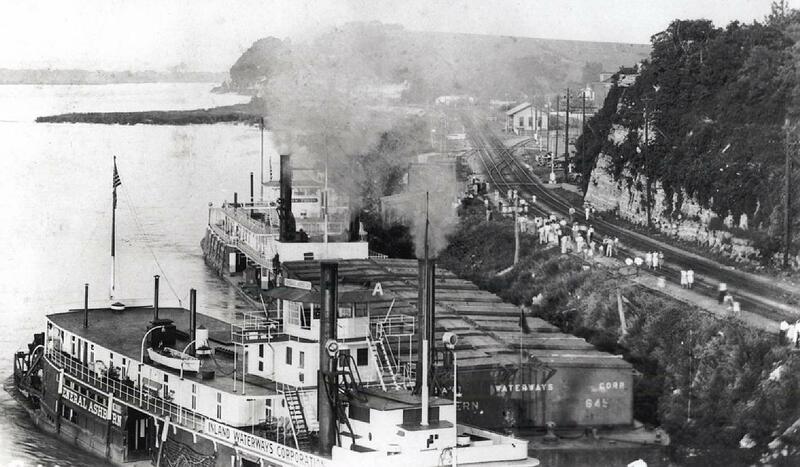 Howell went up the Yazoo River to Silver City, Mississippi—the first steamboats to do so for many years; work was underway there in closing a breached crevasse. 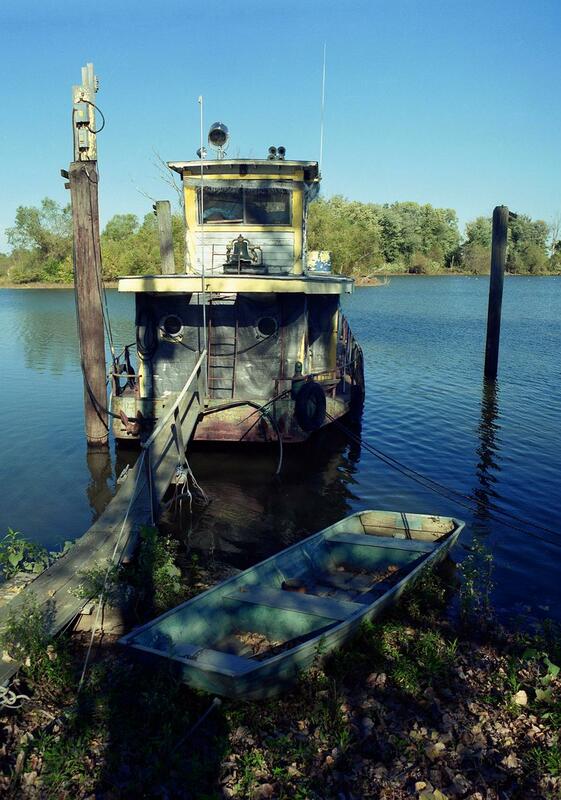 In February 1941, Captain Prince sold her to parties in Harvey, Louisiana who dismantled her. Captain Benjamin Bernstein, master, 1929; S.M. Bigby, chief engineer, 1929; Captain Sam F. Haney, master, 1932; Frank Burdick and Robert Young pilots, 1932. Excellent quality original 8 x 10 received October 2016. She was named for a wholesale grocery owner in Nashville. Just received today (8 Sept 2016). Much sharper than pictured on auction site and scanned up nicely. Perhaps taken at an Arkla Lumber Co. riverside facility or a boatyard. A quaint and picturesque image. Had been named H.H. WIGGIN before becoming the ARKLA after being purchased by the Arkla Lumber Co. circa 1925. 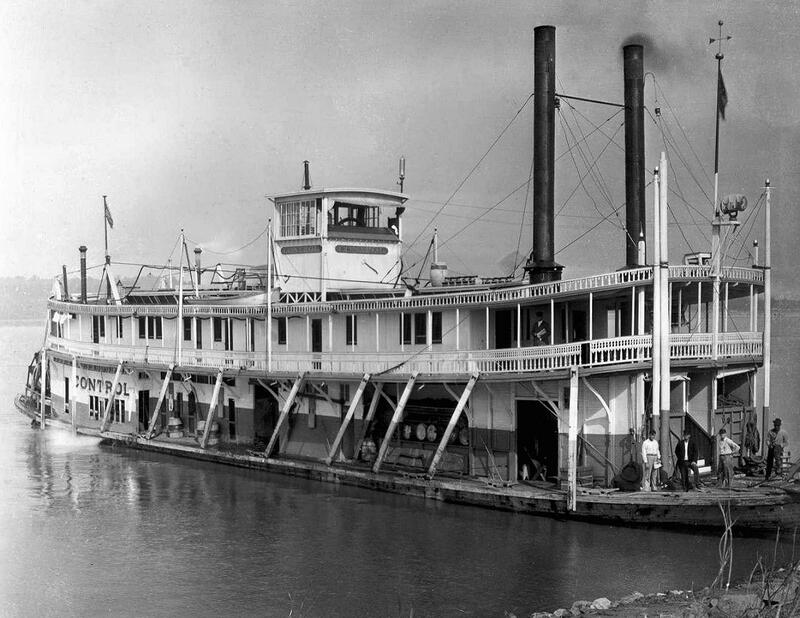 She burned on the Bayou Teche on June 16, 1934 at Patterson, Louisiana during the height on a severe storm which caused great damage all along the lower Mississippi and Louisiana bayou regions. Jim Hale made some observations about my photo of the Towboat ARKLA which I responded to and shared them with model maker John Fryant who supported some of my speculations. Jim Hale's observations inspired me to speculate that perhaps the ARKLA was at this boat yard for maintenance, modifications or upgrades. A sort of "work in progress." 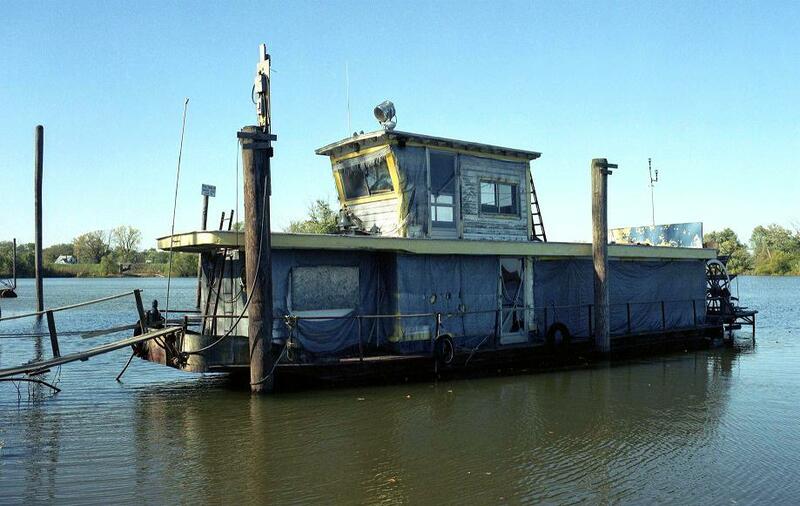 VERY NICE LOOKING TOWBOAT. CANT QUITE FIGURE OUT THE TIMBER FRAME THAT GOES FROM MAIN DECK UP AND OVER THE PILOT HOUSE. DOESN'T SEEM TO HAVE ANY HOG CHAINS ATTACHED TO IT. DOESN'T LOOK LIKE THE STACKS ARE HINGED TO DROP BACK ON IT. I LIKE THE SMALL TUG TIED ALONG SIDE OF THE BOAT WITH A BARGE. Dave,Regarding your photo of the ARKLA. I agree that she is being worked on. The frame over the pilothouse was no doubt a temporary fixture. Note the front port hog chain post: There are two short wooden strips extending from the top of it, probably put there to keep the iron rod from slipping off. This tells me that the hog chains wee being repaired of replaced. Perhaps the large wood frame was a part of this operation. This photo perhaps taken at an Arkla Lumber Co. riverside facility or a boatyard. A quaint and picturesque image. Built in 1915 by the Charles Barnes Company, Cincinnati, Ohio; the unassembled components of the boat were shipped from Cincinnati to Granite Rocks on the Murray River in South Australia and upon completion it was launched in 1916. In style the STURT was a "pool boat" like the well preserved W.P. SNYDER JR. on the Muskingum at Marietta, Ohio. The CAPTAIN STURT, being built in the style of a Western River's steamboat with a sternwheel was unusual in Australia where most of the "paddle boats" were sidewheelers. The STURT was primarily used in the construction of 14 locks and dams, on the Murray River in South Australia, then was retired in 1935 and in 1938 the South Australian government sold her to someone who converted her into a house boat for a while and sometime after that she became a museum boat until around 1988 when she was abandoned, her hull resting as seen in the photo on the right on the bottom of the shallows next to a jetty at the old river town of Goolwa on the Murray. 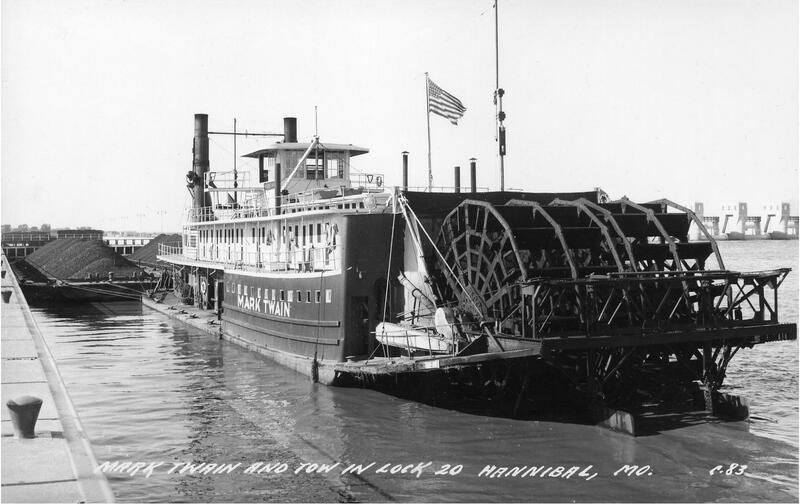 Here is the poignant caption under the attached photo of the boat's deteriorated sternwheel: "The paddlewheel of the massive stern-wheeler, P.S. Captain Sturt, that has been broken up and carted away since this photograph was taken." Wish someone in Australia had recognized the historical significance of the STURT and spent the time and resources to restore and preserve her for posterity. The cover photo of the sidewheeler ADELAIDE and the photo of the derelict STURT are both copyrighted by the book's author, Kit Bennett. For those interested in getting a copy of this book (which is very worthwhile with excellent photographs and text) you can contact Bradstreet's in Hawthorn, Victoria to see if copies are still available. I bought my copy from them and was impressed by their prompt service and fast shipping to the U.S.
Below is a photo of the CAPTAIN STURT when she was brand new. A Blackhawk Films vintage color slide No. 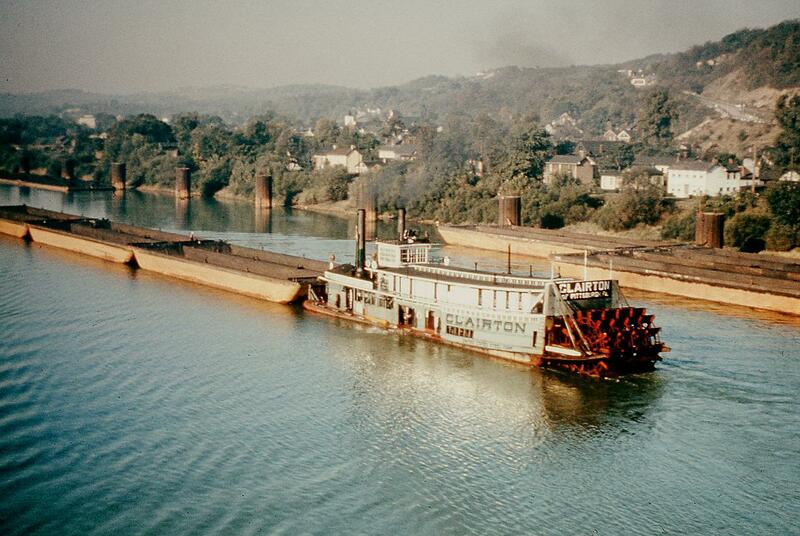 237-9 Clairton on Monongahela River, Elizabeth, PA.